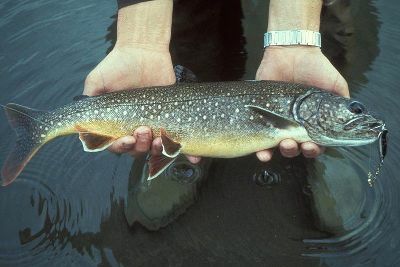 The lake trout is one of the largest members of the trout, salmon, and char family. Lake trout are a slow growing species, maturing around 8-10 years of age. Typically, adults weigh around seven pounds with trophy fish reaching up to three feet in length, weighing 60 pounds or more. The lake trout is a icon of North America’s Great Lakes region although it was almost wiped out during the last century. The decline of lake trout in the Great Lakes involved a combination of overfishing, habitat degradation, water pollution, and the lakes’ invasion by non-native species such as the sea lamprey. By the 1950s, lake trout disappeared from Lakes Erie, Huron, Michigan, Ontario, and Superior. After decades of restoration programs, lake trout populations have begun to rebound. In the Great Lakes and other large impoundments, lake trout restoration efforts hinge on the control of parasitic sea lampreys. These destructive parasites feed on the blood of trout and other fish, eventually causing the death of their hosts. In addition to sea lamprey control efforts, stocking programs have boosted lake trout populations in several lakes of North America. Lake trout are commonly caught by trolling spoons or other brightly colored lures. Anglers use a number of tackle and techniques in order to cover various depths. Although a variety of deep-trolling techniques are effective for catching lakers, the use of downriggers dominates the fishing in most locations.